Most Bromeliads produce new plantlets (pups) freely around the base of adult plants however some do not. 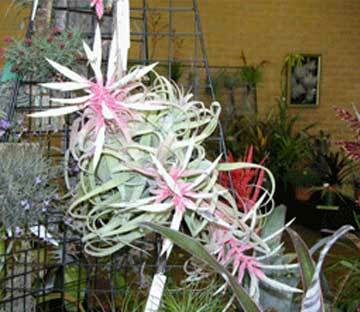 Tillandsias, the air plant Bromeliads include several species that rarely produce pups. In nature these plants regenerate by producing lots of seed but seedlings can take many years to produce an abult plant. It is therefore distressing when you grow one of these beautiful plants to flowering and then watch is gradually die. Recent experiments have shown that the application of Keikigrow Plus around the base of these plants will often induce a few pups to form. These pups will then grow to flowering size much faster than growing new plants from seed. Most African Violets can be readily propagated by plant division or growing plants from leaf sections. Some of the most beautiful African Violets are a group called the Chimeras. These are a group of plants with pin wheel markings on the flowers, the flowers have two distinct colours or variegations. The unfortunate thing about these plants is that they cannot be reproduced by leaf cuttings because the resulting plants do not maintain the chimeras. 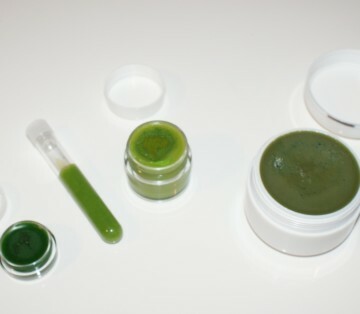 Janet Stromborg developed the technique of applying Keikigrow Plus to flower stalks to produce keikis, little plantlets. Just apply the Keikigrow Plus flower ‘bracts’ which are the tiny leaves that can be found on the flowering stems of blooming African Violets. When the little plantlets are large enough, just remove them from the flower stalk and you will have a new African Violet Chimera. These are the tropical pitcher plants that catch insects in their digestive juice filled containers to obtain extra nutrients. Most Nepenthes are vines that can become quite long and sometimes unmanagable. Nepenthes can be propagated by striking stem sections and this works well for some species but is very unreliable for others. Seeds from Nepenthes can be difficult to produce because there are different male and female plants and they can flower at any time of the year. It is therefore a matter of luck to get your two Nepenthes in flower at the same time to cross pollinate them. Once again Keikigrow Plus can be used to produce new shoots. Apply Keikigrow Plus where the leaf jions the stem and a new shoot should form. This can be used to obtain a new plant or just make your plant grow more bushy and more attractive. Most cacti producs offsets around the base of larger plants which can be removed to obtain new plants. Some very desirable species rarely if ever produce offsets and multiply by producing seed. These cacti can be incouraged to ofset by appluing Keikigrow Plus. Rather than continually pruning bomsai plants to make them branch, you can treat your plants with Keikigrow Plus to encourage branching.